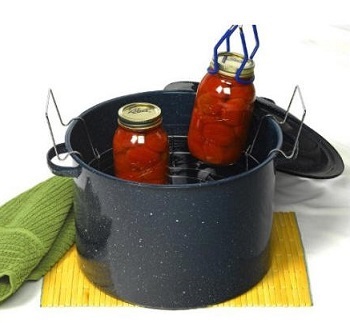 Whether you are canning for your first time or in your 50th year of canning; you will find a selection of water bath canners here, and at the best prices you'll find anywhere! Scroll down this page for photos, descriptions, prices and ordering information. The Complete Home Canning Kit - Around $49 This is the canner and complete kit - everything you need in one package. It is also the same make and model that my family has used for 3 generations - my grandmother made everything from applesauce to jams and jellies to tomato and spaghetti sauce with it! Further description: Ball Home Canning Basics Kit - Let Ball® show you how simple home canning can be. The Ball® Home Canning Basics Kit will give you all the basic utensils you need to start preserving the bounty of your garden or supermarket. The same as the kit above, but without the jars, jar lids, Ball Blue Book and coupons. Around $20. There is a separate kit of supplies further down the page. The manufacturer does not recommend this canner for glass or ceramic top stoves as it does not have a flat bottom. However, our experience is that these water-bath canners work fine on "most" flat top stoves. See my page about using a glass or ceramic stovetop for canning. Blake's rating: long lasting, well built. I have two of these! The manufacturer does not recommend the Jumbo Water Bath Canner Package for glass or ceramic top stoves as it does not have a flat bottom. However, our experience is that these canners work fine on "most" flat top stoves. A stove with a large burner size is recommended. Yes, there really is an electric water bath canner now, and it is sold by Ball. Made of stainless steel, so it should last a lifetime - it would also make a great pot to cook applesauce. I have one of these. Heat resistant silicone handles protect your hands and ensure a secure grip. Dual steam vents on the lid prevent fogging so you can see inside. Corrosion resistant rack holds jars of various sizes. 21-quart size. Stainless steel. Hand wash.
Reviewers say this works well on their induction stoves! Blake: I also have this one, and it it is my favorite: it's big, stainless steel, has a clear lid, and a thermometer built into the lid. This heavy weight aluminum stock pot is handiest cookware item in the kitchen. It can be used as a canning pot or cooking pot. If you choose a size and dimensions that fit your heating element, it will work with many types of cook surfaces. It is constructed of heavy gauge reinforced aluminum. It helps in making stock, broth and stews to braising meat or steaming lobster or crab. This can be cook nearly anything inside its wide base and high walls. Its aluminum build provides excellent heat conduction. NSF certified. Thickness is 6-mm. Measures 10-1/2-inch width by 9-1/8-inch height. Comes with 12-quart capacity. Note that it does NOT come with a lid. Lids can be ordered separately (see below). If you have found that the standard canning pots boil over and spill hot water because you have to fill them so full to ensure that quart jars are covered by 1 to 2 inches of water, then here is the solution. This pot is not called a canner, but it works perfectly well as one. The rack from your old canner will fit inside it (I don't use the perforated plate that you see in the photo - it coesn't seat well with the weight of 7 quart jars on it . And because it is 32 quarts in volume rather than 21, the water returns to a boil faster after you put the jars in it. This pot adds to safety and reduces mess. And, of course, you can use this as a steamer pot for seafood and other foods, too! This pot is usually available through Amazon - but sometimes they run out - the brand is Vasconia, and it is a 32-Quart Aluminum Steamer with Lid. If this brand isn't available, the Bayou brand turkey fryer pots are almost identical, just 4 quarts larger in volume.And then you can use your existing canning rack or get one here. This seven-piece canning kit provides all the essential tools needed for getting started. Jar lifter easily and safely lift hot jars from a canner. If you already have a 10 qt or larger pot, and you only made a few jars at a time, this may meet your needs. This is also perfect for canning small jars, like the 4oz, 8 oz and pint jars that can slip through the standard canning racks. 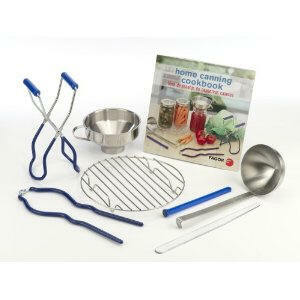 Home Canning Kit contains all the essential canning tools in one simple kit. The Home Canning Kit contains a convenient Lid Lifter, Canning Funnel, Jar Lifter, Jar Wrench, and Kitchen Tongs, plus a rack. These items can also be purchased separately, but the kit's price is less than the separate prices. These are great tools for water bath, steam, or pressure canning. Blake's rating: Great accessory kit! 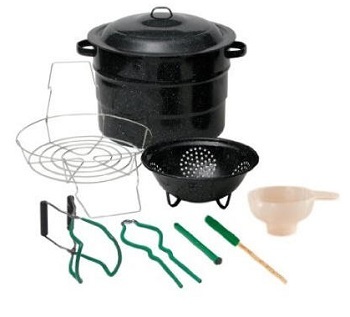 These kits have the jar tongs and everything else you need, except for the canner and rack. Funnels to fill regular and wide mouth canning jars! Lid lifter - to pull the lids out of the hot water, again, without burning your hands! These Water Bath Canner Rack fits most boiling waterbath canners. If you have a glass or ceramic stovetop, you may have found that it is impossible to find a canner for you stove! Look on this page!